Don’t toss out those glass jars when you are finished with them. 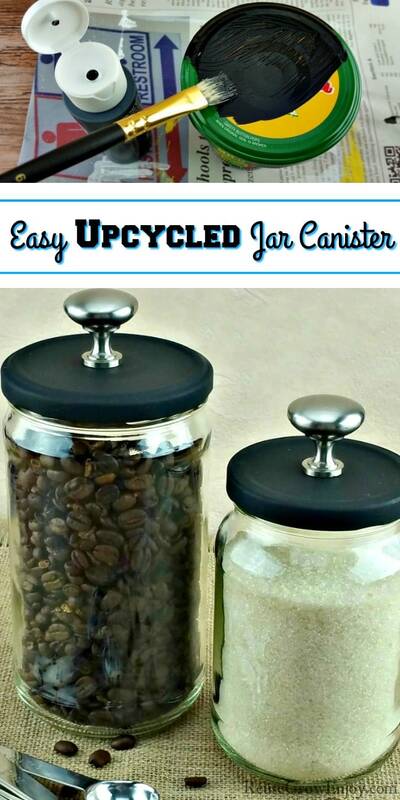 You can turn them into upcycled jar canister in just a few minutes! What do you do with your jars after you have finished things such a salsa, sauce or other items? Do you just toss them out? Did you know there are some wonderful ways that you can reuse them? Such as turning them into an upcycled jar canister. It is something you do not even have to be a super crafty person to do it either. It is really easy! 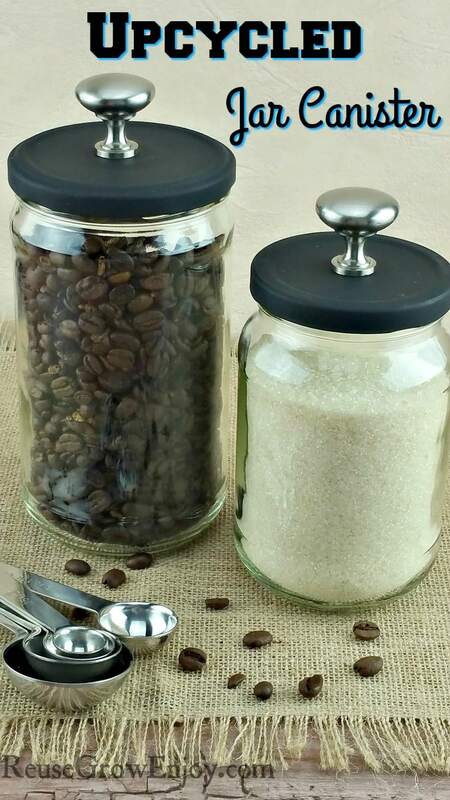 You only need a few things to turn a regular jar into a super cute canister to put on the counter. Works great for storing things like sugar, coffee, oats, flour and just about anything you can think of. They also make for cute canisters in the bathroom for holding things like cotton swabs, cotton balls, makeup remover pads and so on. The first thing you need to do is give the jar a good washing. Then remove all of the labels. If you have a tough time getting all the glue off, try using some natural glue remover on it. Then you want to take the top and place it on something so that it is not flat on the table. The reason it cannot be flat on the table is that it will stick as the paint dries. Take your paint and cover the top and all the way around the sides. Then allow to fully dry. It took two coats for mine before the jar top was covered. You do not need to coat the inside of the lid. This is where the school glue or Mod Podge comes in. 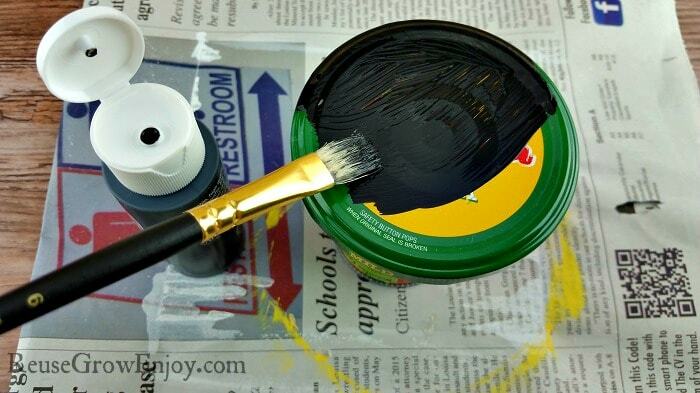 If you are worried about the paint slowly rubbing off, after the paint is fully dry, you can then coat it with the glue. It will dry clear and act as a sealer so the paint does not rub off. I did not put it on mine as I think a little rubbing off just makes it look aged. Plus I could always recoat it again if I changed my mind. Now after the top is all coated and dried, use the hot glue to attach the knob to the center of the top. 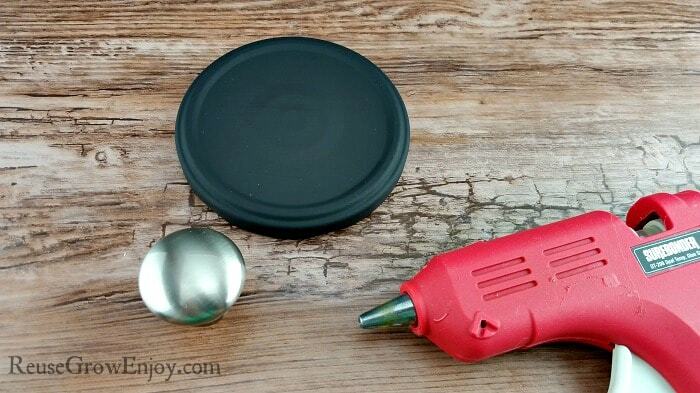 You want to be sure to use a good amount of glue so the knob stays in place. But not so much that it comes out the sides and you see it. Update: After having these for a while I have found that the hot glue can eventually allow the knob to come off after a lot of use. If you want yours to last a long time, consider using something like epoxy or E6000 adhesive in its place. That is it! 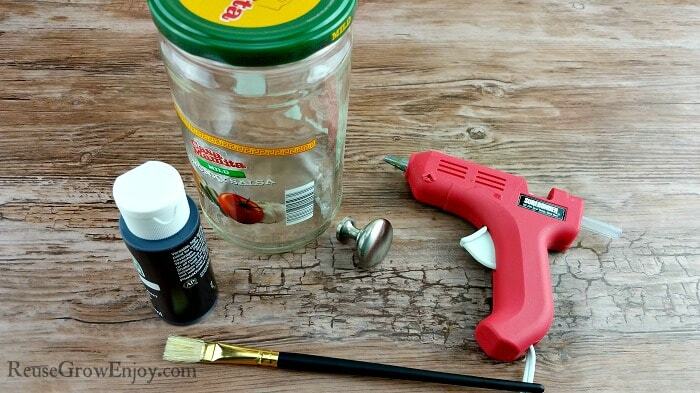 After the hot glue is dry, you can fill your new upcycled jar canister with whatever you want and place it on the counter. If you liked this post, here are a few others you may want to check out. Thanks Ellie! Happy you love them as much as I do! You will love the Judy! Super easy to do and the look awesome when done! I think they would work really well for cotton balls and Q-tips too. Wow! What a terrific idea! Now I know what to do with all the tons of cabinet door knobs I got for almost nothing at a garage sale! Thanks for posting this, found it on Pinterest of course. Oh I love find awesome deals at garage sales! I think you will be happy with these jars, I know I love mine! Is there a suggestion on putting a labeling theme that ties in with the look so you can identify what is in the jar? Will chalk paint work on glass? Is there a stencil style available to make the label? Hi Christy, you can paint glass with chalk paint. But if it was me, I would just go with a chalk label stickers you can find them at craft stores or places like Amazon. Any reason you don’t use a paint that doesn’t rub off? Such metal spray paint for metal,lids? Just a suggestion. I find those types of paints often are really toxic and I am trying to cut things like that down in my home. But yes, they would also work if that is a type of paint you don’t mind. The knobs are cute but are they functional since you still have to twist the lid off? I like to use chalkboard sticker labels for my glass storage jars. Sticker labels would be a great idea! As for the knobs, no they are not functional for the twist off lids. They are only for look. However, a fix for that if you have a lid that is not a twist off, would be to put a hole in the center of the lid and place a screw through it. Then you could screw on the knob for it to be functional. Is the acrylic paint safe for food? Your post did not say. I have had no issues with the paint and mine has food in it. But the food never really comes in contact with the paint either, as the paint is only on the outside of the lid and not on the inside. They make nice candy jars or even hold things like paper clips, pins and much more. Ideas are endless. They are great for some many things.